It is the greenest little building in Portsmouth, VA, even though it is blue on the outside. But the Fred W. Beazley River Academy is much more than an environmentally friendly building. It is a visitor center, classroom, storage facility, an example to homeowners, and the centerpiece at the Paradise Creek Nature Park. According to Marjorie Mayfield Jackson, the executive director of the Elizabeth River Project (ERP), it is also a magnet. “It continuously attracts people to the park,” she noted. 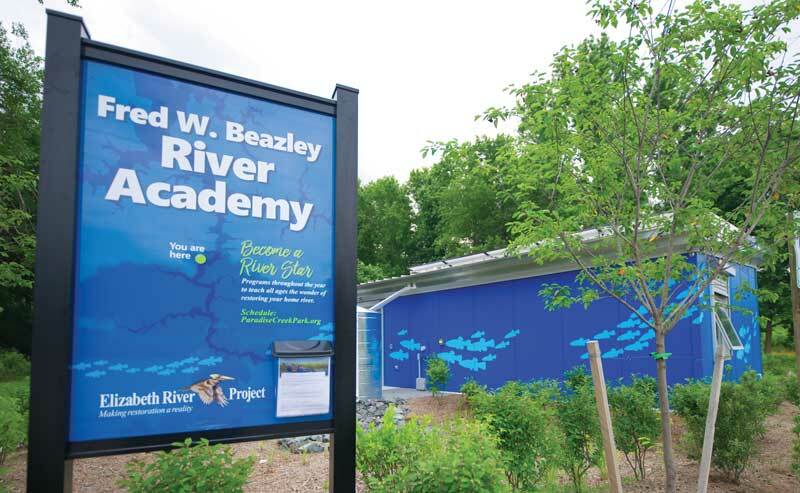 The Fred W. Beazley River Academy is a great facility that will teach you about the local environment. It was a long time in the making. When the ERP was designing the 40-acre park in Portsmouth, the master plan included an educational facility. The park opened in 2012, but without any such facility. Literally hundreds of school kids visited the park each year, but they had no place to get out of uncooperative weather. Educators had to bring their materials to and from the park each day. There were no audio-visual capabilities, which is a must in today’s high-tech educational environment. The University of Virginia School of Architecture came up with some initial design concepts. From there, a variety of local businesses and individuals stepped in to provide materials, labor, and funding. The largest financial sponsor is the Fred W. Beazley foundation of Portsmouth. It all came together in April 2018, when the 1400-square-foot building was officially dedicated. The green components start with solar power. The 20 panels generate enough power to run the building year-round. However, there is no capacity to store electricity. When the building generates more power than it is using, it feeds the excess back to the grid. The building also incorporates passive solar features. Specially designed windows and the roof overhang allow the sun’s warmth to enter in the winter, but block the heat rays of August. A concrete floor stays cool in the summer, but absorbs and holds solar warmth in the winter. The windows also allow lots of natural light. The building is oriented to take advantage of the sun and prevailing breezes. The River Academy is water friendly as well. Dual-flush toilets use about half the water of traditional toilets. All outside surfaces are permeable, so water goes into the ground and does not run off into the adjacent wetlands. Cisterns collect water for landscaping. The building is surrounded by native plants that thrive without excess fertilizer or care. The building materials are green as well. The plywood is certified by the Forest Stewardship Council as coming from well-managed forests. The building and park are open to visitors seven days a week. During the summer, the park is open from 6:30 in the morning to 7:30 each evening. Sheriff deputies open and close the gate each day, so don’t overstay! The building entrance is on the north side by a big cistern. It looks more like the back of the building than the front, but just follow the fish painted on the outside walls, as they lead right to the door. The Fred W. Beazley River Academy is a great facility that will teach you about the local environment. It will inspire any homeowner to add some green features to their own home and yard. For directions and more details, visit the Elizabeth River Project.